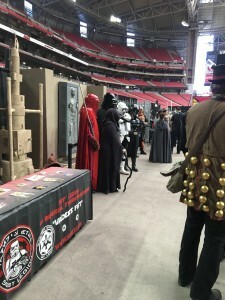 Phoenix Comicon’s Fanfest is a nice Winter geek interlude in the long, dark months between the major Summer conventions. 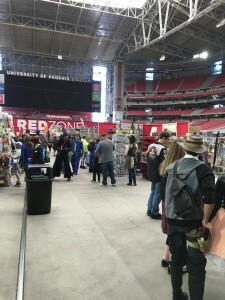 Fanfest has many elements of a standard Comicon (panels, famous people, artists and vendors) but is much simpler affair. 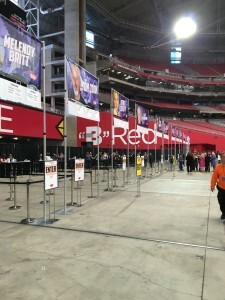 Rather than the massive Phoenix Convention Center Fanfest uses the University of Phoenix football stadium as its venue. 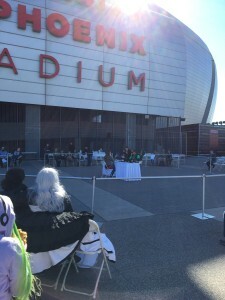 Since there is no gaming at the Fanfest, this post is more of a general report and plenty of shots of the Saturday I was there. Oh, and yes the entire thing ran either in rooms under the seating or on the playing field, minus the grass of course. Fanfest focuses on the autograph/meet aspect of Comicon, so there were a variety of actors, artists and geek idols of note. 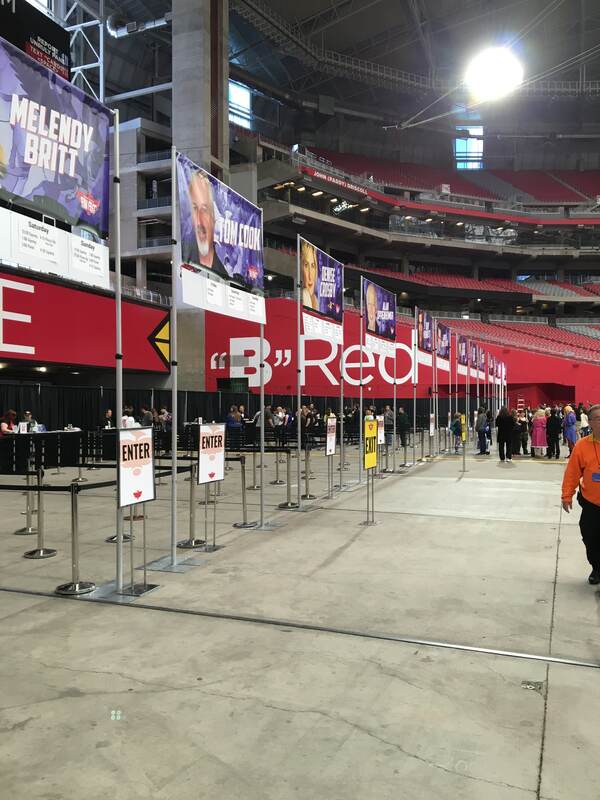 The lines were short when I was there, but there were also relatively few “notables” running their booths. 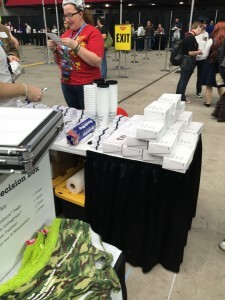 Here is a shot of the Disney-snake lines to get an autograph. 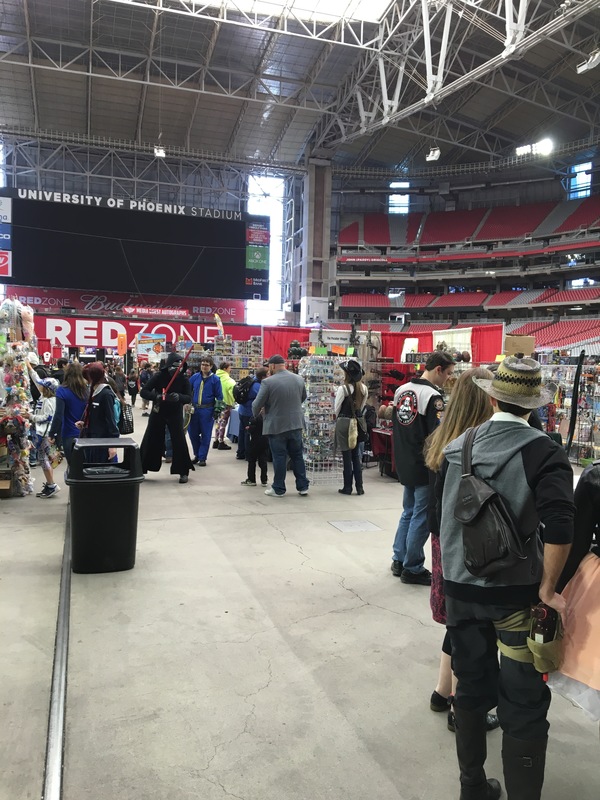 I give Fanfest credit for a clean and organized setup. 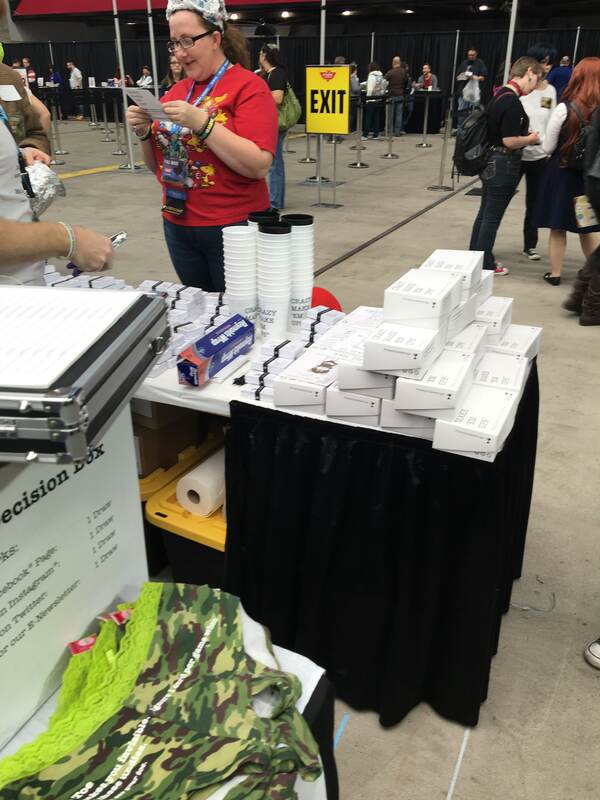 You buy a ticket at a non-pictured booth and then hop in the line you want. Going rate was between $30-40 per autograph/photo-op. 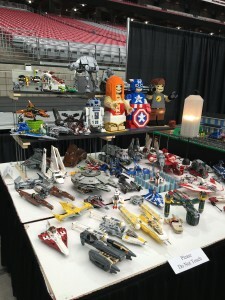 The vendor area made up a large portion of the event. Vendors ran the gamut from clothes to toys and everything in between. 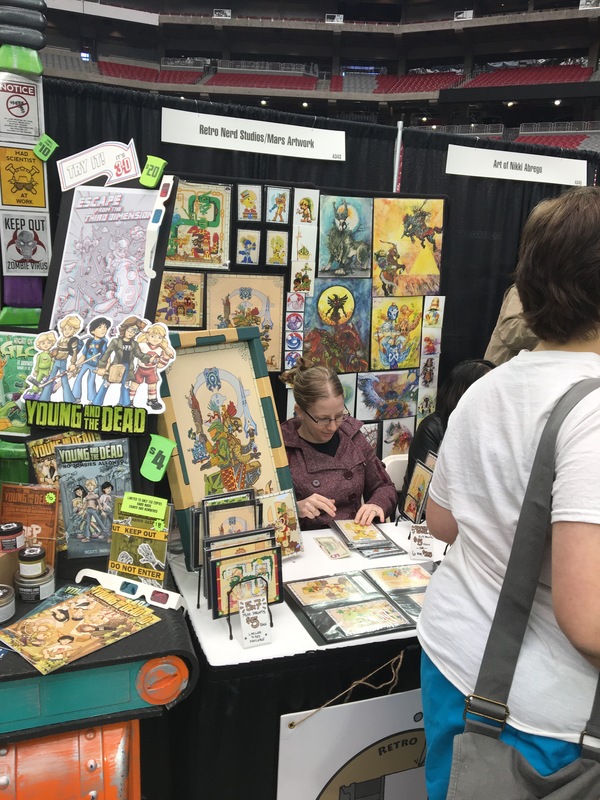 Here are a few of the vendors I thought had some interesting stuff (even if they were not necessarily selling anything, several clubs/non-profits had booths). 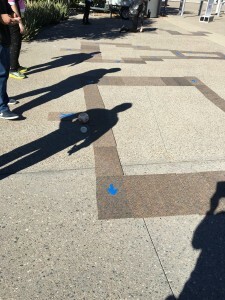 efforts looked like a cityscape by Salvador Dali…after sustained carpet bombing. Smoke Tree Workshop had laser cut, stained wood icons of geekery for your walls. CMEU incorporates elements of “Cards Against Humanity” and live action activities, such as making a tin-foil hat. Not really my cup of tea, but the team behind CMEU deserves much credit for working that booth. They ran a contest/scavenger hunt involving their game, were happy to run demos and gently dragged any human being nearby into the booth. 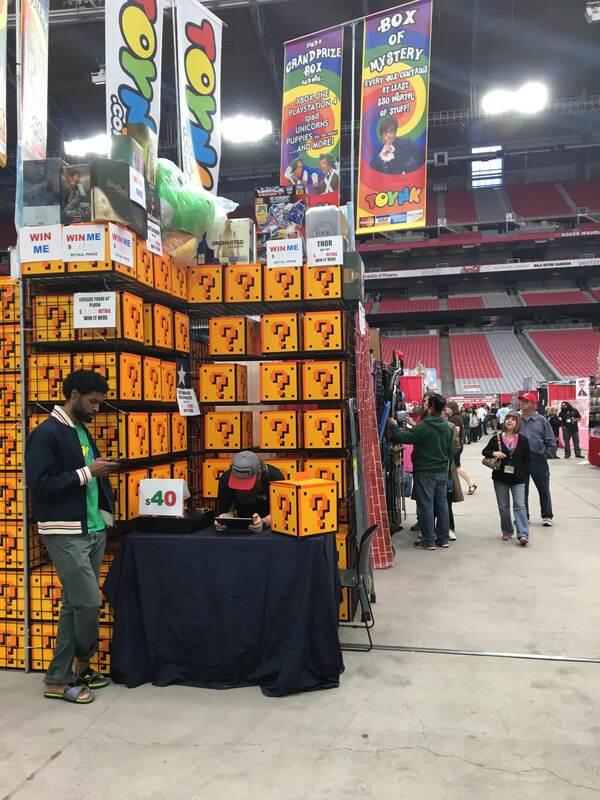 Their booth was packed and games were sold. Rant interlude: Vendors of Comicon, you paid hundreds of dollars for floor space to sell your product and then play on your phone all day hoping your product sells itself as people walk by? This is a waste of money. Setting up at a show is a business, so start acting like it! 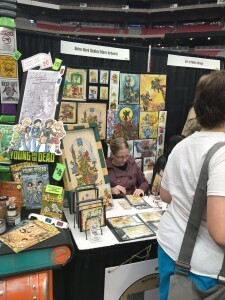 Sorry for the rant, but watching potential sales walk past interesting products because the vendor is either too lazy or shy to hustle some business drives me insane. You have perhaps 10 seconds to make your pitch to a prospective customer, so make it count! 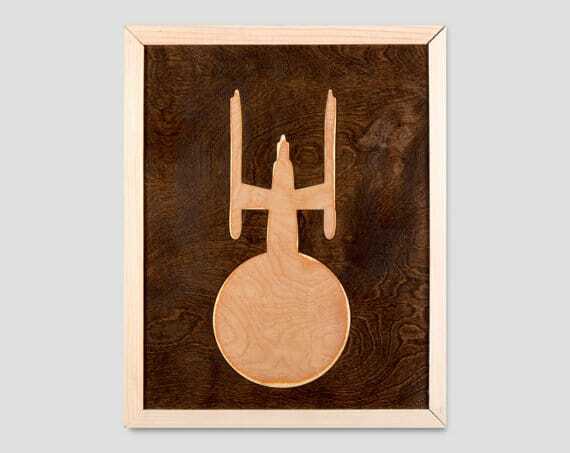 This is especially sad with the artists who created great art, but could not sell Ketracel-white to a Jem’hadar! I wonder how many artists gave up their work because they could not make a living selling it. Sad. I took a picture of a giant squid for one of the cosplay groups. 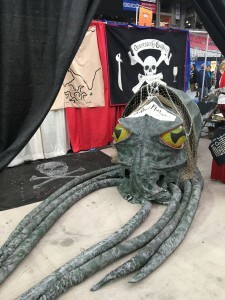 Squids are cool. Not much else to say really. This had to be my show favorite among the artists. 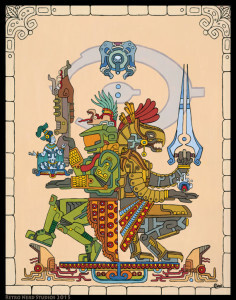 Retro Nerd Studios combined Mesoamerican art with videogame characters. Here is a close-up of the Master Chief/Arbiter print I am eyeing. Ah crap, who invited these guys? 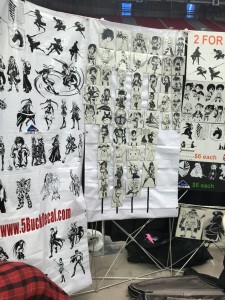 There were many other vendors, but they had the usual assortment of art prints and Japanese kawaii anime goods. The ones above just caught my eye. Oh, I did notice “Attack on Titan” was everywhere this year. That and Deadpool. I wonder if anyone thought to strap the “Titan” maneuvering gear to Deadpool? Might make for an interesting cosplay moment. Two hardy gladiators dunk cookies into hot tea for 3 seconds and then remove it. The loser is the one whose cookie breaks first or you can eat your cookie and your opponent must eat it cleanly, without dropping anything on the ground. Competition was strangely intense and in this case, the pudgy Green Arrow lost. He wore most of his cookie. They were running a “BB-88” obstacle course contest in the parking lot, but, well, just see the horror for yourself. Well, that is all for the 2015 Phoenix Comicon Fanfest. I will see you all at Comicon in the Spring!